Are matrix structures inevitable in complex organizations? Unfortunately, there is a lot of confusion about this. One reason is that textbooks and articles fail to provide good definitions. A book I just read proclaims that the matrix “is an excellent choice” for higher education institutions. But it doesn’t describe in any detail what it is. Consultants and “thought leaders” who recommend this solution aren’t very precise, either. This is one reason why some misconceptions have taken hold. Let me address the three most common ones. Misconception #1: We are talking about the same thing when we use the term “matrix organization”. It might be a good idea to combine two different dimensions. But this type of illustration is not very helpful in itself. The reason is that it leaves a lot of questions open to interpretation. What IS it supposed to show? Does it mean that the units that are connected by the lines are supposed to collaborate, and if so, about what and in what manner? Does it mean that people in these units will participate in joint meetings, teams or projects? Does it mean that these units will share the same goals and KPIs? Or all of the above, or none of the above? When the matrix solution was first introduced, it was relatively clear what it entailed. But it has gradually become a very ambiguous concept. There are also multiple variations of it, and these variations are usually not described or discussed. As the author Stephen Haeckel put it, ambiguity is good for many activities in life. It’s a good thing if you are writing a poem or creating an abstract painting. But it is the mortal enemy of good systems design. So the kind of drawing that you see above is not very helpful – unless we specify what we mean. To do that, we need to use a different format, we need different types of illustrations – and a more precise vocabulary. Only then will we be able to explore what the actual design options are and identify the risks and limitations of the different alternatives. Only then will we be able to create a common understanding among those who are involved in making the decision about a new organizational model. It is fairly common to hear that the main problem with the matrix is that it’s difficult to work for – or report to – multiple managers. However, there are few organizations today, matrix or not, where you only relate to one manager. In most organizations, regardless of reporting structure, you work for multiple managers, participate in teams and projects, contribute to cross-functional improvement initiatives, and so on. This can be time-consuming for sure, but it is not necessarily the main problem. What is problematical, however, is reporting to two or more managers if the goals and KPIs that these managers have been assigned are in conflict with each other. This may be the case if the units that the managers belong to have conflicting mandates or overlapping jurisdictions, something that happens relatively frequently in large and complex organizations. And installing matrix reporting lines doesn’t do much to resolve this problem. On the contrary, it will probably make it worse. Some proponents of the matrix solution basically say: “Either you have a modern organization with a matrix, or you are old-fashioned and have a silo organization”. In my opinion, this is a false dichotomy. It is based on a confusion between two different things – the formal reporting structure, or who should be the line manager, and the extent of information sharing and collaboration across units. It’s false dichotomy because you can of course have extensive collaboration across units even in an organization where every employee has only one line manager. 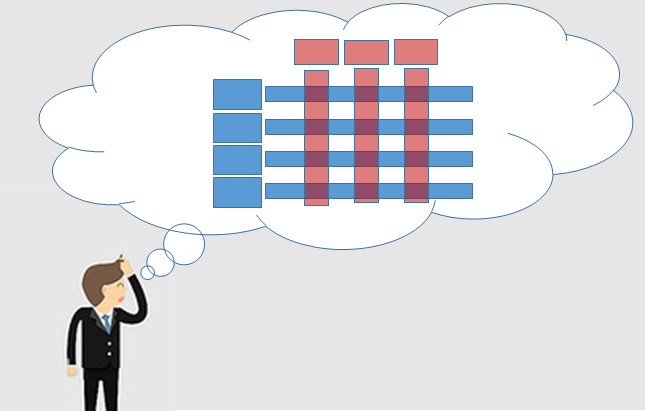 The matrix is one type of multi-dimensional organization, where you have different units such as product units and geographical units at the same level in the organization. 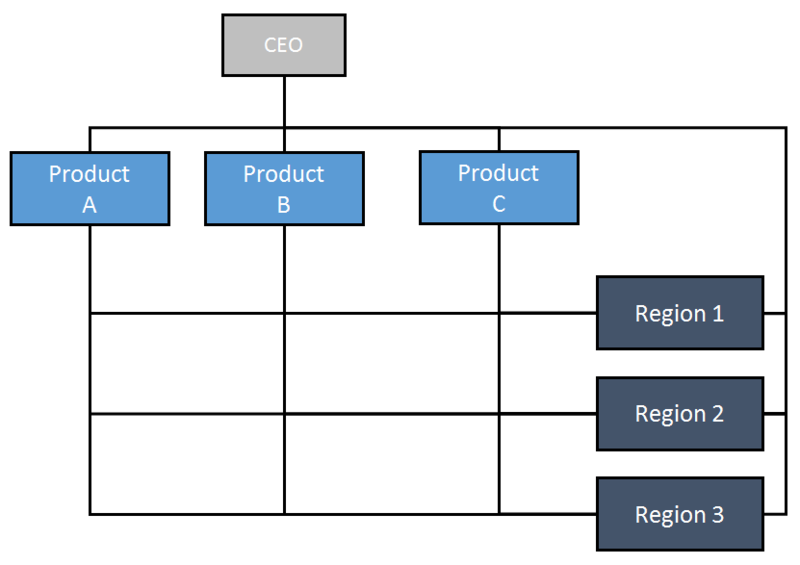 However, as I describe in my book, there are other organizational models that also have this feature and that look similar on paper, but that do not assume that employees report to two bosses and do not require overlapping goals and KPIs (see a brief summary of the line of reasoning in this blog post). 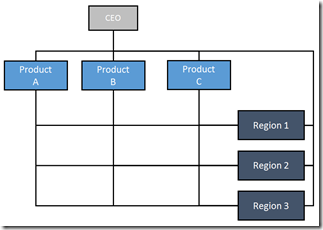 The matrix organization is also quite rare (if you define it as I do – “a two-boss reporting structure”). During the last 7 or 8 years, I have interviewed managers in about 40 different firms. Only 2 or 3 of these firms had a matrix with a two boss reporting structure, and in these cases, it applied to a relatively small group of people, typically middle managers at one specific level or in one part of the organization. So at least in my experience, a formal matrix structure is not very common. However, what is quite common is something I call a hidden matrix. By that I mean governance processes and authority relationships that cross the formal units, but which are not shown on the official organization chart (and that are usually not deliberate). This is an important issue, which I will discuss in my next blog post. If you have a question or comment, feel free to enter one below! I agree with you, Nicolay. The richness of the Matrix model is often hidden and many organisations do not spend enough time agreeing how collaboration and governance should operate. Worse still, when the structure of an organisation is re-organised, well functioning collaboration and governance processes are often broken causing further inefficiencies. Regarding the Matrix diagram, I find that my clients relate better to pictures in the first instance as they can illustrate inter-relationships between departments and teams more easily. In the end, however, you have to come up with an organisation chart. I wonder if we will ever discard it completely? I think we might one day. Thanks for your comment, James. Yes, illustrations that show working relationships or interfaces of different kinds can be quite effective. I also use design matrices, will write a blog post about this tool later and you can then see if it’s something that may be relevant. As for organization charts, I think they do have a function, as they show basic things like the grouping of roles into teams, and who is the line manager. However, as a former boss I had said, “the organization chart should be the output, not the input to the organization re-design process”. Fully agree with You : The org Chart is the output of an Org Design process not the input. 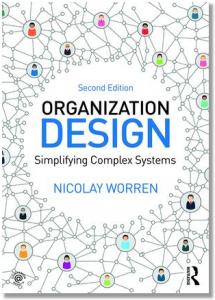 The ultimate Goal of Org (Re-)Design is to meet the ( new ) Business Requirements, and Org Design ( with all its levers : Org Chart, Processes,Metrics, People practices…) is shaping the way to reach this goal. Coming to the Matrix Organisations, they are fully valuable for large organisations just under the condition of clear Processes, Decision Rights , Governance, People relationships. Very good article Nicolay, for me its very difficult to give visibility to my leaders in Mexico about the complexity of this organization structure implementation. Thanks for your comment, Juan. Yes, I agree; one often underestimates the complexity of these models.